Cat Mace – An outlaw and gambler, he was wanted for killing two men in Texas. He was killed by Jim McClease at Colorado in the 1890s. John W. Mackey, aka: “Buttermilk John” – Outlaw member of the Christian Gang in Oklahoma, he was captured in 1895 a short time after the killing of Deputy Sheriff W.C. Turner. Patricio Maes – Outlaw member of Vicente Silva’s White Caps Gang of Las Vegas, New Mexico. He was hanged by the gang on October 23, 1892, as a suspected traitor. Zenon Maes – Outlaw member of Vicente Silva’s White Caps Gang of Las Vegas, New Mexico. German (Herman) Maestas – Outlaw member of Vicente Silva’s White Caps Gang of Las Vegas, New Mexico. He was hanged on May 25, 1894, in Las Vegas for killing his common-law wife and her lover. Tomas Madril (18? ?-1875) – A member of the Mes Gang, which competed with the John Kinney Gang in New Mexico. On August 8, 1875, Madril, along with Jermin Aguirre, Jesus Mes, and Pas Mes were ambushed and killed by the John Kinney Gang and Jessie Evans near the San Augustin Ranch. John Mahoney – An outlaw, Mahoney was one of the gang that killed Jock Harriman on December to, 1883, in Wallace New Mexico. Manuel Maldonado – Outlaw member of Vicente Silva’s White Caps Gang of Las Vegas, New Mexico. Smoker Mankiller – A Cherokee Indian outlaw, he shot and killed his neighbor in Indian Territory. He was hanged at Fort Smith, Arkansas on September 3, 1875. Abler Manley – When Ellis McVay, an Oklahoma farmer, provided shelter for the night of December 3, 1880, for Abler and his brother, Amos, the two were obviously unappreciative. Before they left, they killed McVay and cut off his hired man’s hand. Their motive was unknown. Tried and convicted of murder, both were hanged at Fort Smith, Arkansas on September 9, 1881. Hilario Mares – Outlaw member of Vicente Silva’s White Caps Gang of Las Vegas, New Mexico. Marlowe Brothers – Outlaw brothers, Boone, Alf, Epp, Charley, and George were horse thieves who killed a lawman in 1889. During the gunfight that ensued, Alf and Epp were shot and killed. Boone was later poisoned by bounty hunters, and George and Charley fled to California. Stephen Marshland – A road agent in Montana and thought to have been a member of Henry Plummer’s gang of Innocents. He was hanged by Montana Vigilantes. 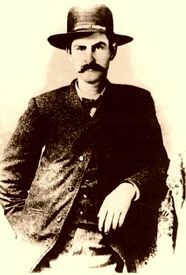 William Martin, aka: Wild Bill, Jones – An outlaw in Lincoln County, New Mexico, he was killed by John Perry in June 1887. Samuel “Wolfman” Mason – Getting his start as an honorable man, Samuel Mason served as a militia captain in the American Revolution. Later, however, he would turn pirate on the Ohio and the Mississippi Rivers and lead highwaymen along the Natchez Trace. Robert Massey (18? ?-1883) – As Massey and a man named Edmond Clark were driving a cattle herd from Dodge City to Dakota territory in the summer of 1881, Massey shot Clark in the back of the head. Massey took Clark’s possessions as well as the proceeds from the cattle sale. He was arrested the following April, tried and convicted of murder and robbery and was hanged at Fort Smith, Arkansas on April 13, 1883. Dave H. Mather, aka: Mysterious Dave (1851-1930?) – Known as both a lawman and an outlaw, Mather tended to lean towards the lawful side, serving as a Dodge City, Kansas Marshal; El Paso, Texas Assistant Marshal, and a U.S. Deputy Marshal in New Mexico. However, he was also involved with the lawless Dodge City Gang in Las Vegas, New Mexico and was suspected several times of horse and cattle rustling. Clarence L. “Gunplay” Maxwell, aka: James Bliss, Thomas Bliss, William Seaman (1860?-1909) – Actually born James Otis Bliss, this outlaw/gunfighter is best known as “Gunplay” Maxwell. A bank and stagecoach robber, gunfighter, and miner, Maxwell was killed in Price City, Utah by Deputy Sheriff Edward Johnstone in August, 1909. John McCall, aka: Jack, Broken Nose Jack, Bill Sutherland – A gunman, shot and killed Bill Hickok on August 2, 1876. He was hanged for murder on March 1, 1877. Bill McCarty – An outlaw, brother of Tom McCarty, and brother-in-law of Matt Warner, he joined his brother in the McCarty Gang, and was killed during the Delta, Colorado bank robbery. Henry McCarty, aka: Billy the Kid – An outlaw and member of the Aelbee gang in South Dakota, he was frequently confused with New Mexico’s Billy the Kid, who also used the name as an alias. Patrick McCarty (18? ?-1887) – McCarty killed Thomas Mahoney and his brother in the Cherokee Nation. The two victims had been working on the railroad, and as they were returning to Kansas, McCarty was traveling with them. While the men were sleeping he shot one and bludgeoned the other with an ax, taking their teams, wagons and $200. He was captured, convicted of murder and hanged at Fort Smith, Arkansas on April 8, 1887. Tom McCarty (1855-1900?) – Raised on a Morman ranch in Utah, McCarty began his outlaw life at an early age and is credited with introducing Butch Cassidy to the life of banditry. When he was 18, he married Teenie Christianson, sister to Willard Christianson, aka, Matt Warner, who was also a Mormon. Somewhere around 1892, he and his brother, Bill McCarty; and brother-in-law, Matt Warner, held up a bank in Roslyn, Washington. However, when an angry crowd approached him, he opened fire, wounding two men. The next year, the McCarty brothers, along with their nephew, Fred McCarty robbed a bank in Delta, Colorado, in which, Tom shot a killed the cashier, A.T. Blachey. When citizens heard the gunfire, they rushed the bank and shot and killed Tom’s brother, Bill, and his nephew. Tom McCarty was able to escape and fled to Montana where he settled down and worked as a sheepherder. However, around 1900, he was killed in a gunfight in Bitterroot County.